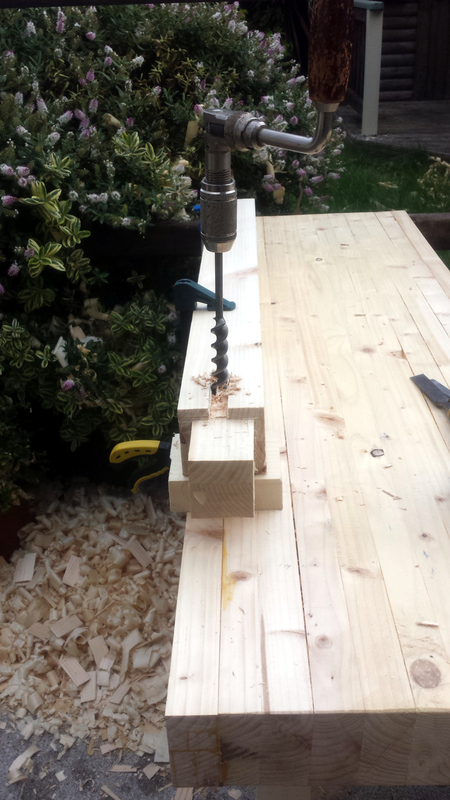 Another day, another few hours learning why I’m an engineer instead of a carpenter. No rain, but on-call at work, so I no sooner had the tools out and the tarps off in the back yard than the phone rang, and that was three hours gone before I’d gotten started. But on we go. Works like a charm. Still putting in a tail vice to have the option (and because it’s already ordered, so strap in, we’re committed). But I can see how people could get along without one using one of these things and a holdfast. 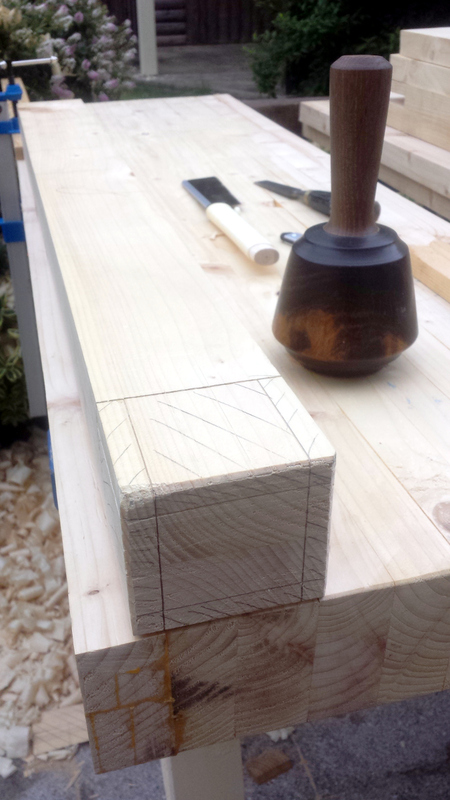 Then I cut the tenon out on one end of the stretcher by sawing the shoulder and chopping out the cheeks with a chisel, which is how I’ve been doing most of the joints so far. I think the end result is very reminiscent of modern art, in that it doesn’t look anything like what I was thinking of and definitely doesn’t look like something someone should be doing for a day job. But at least it’ll work and drawboring hides a multitude of cack-handed sins. 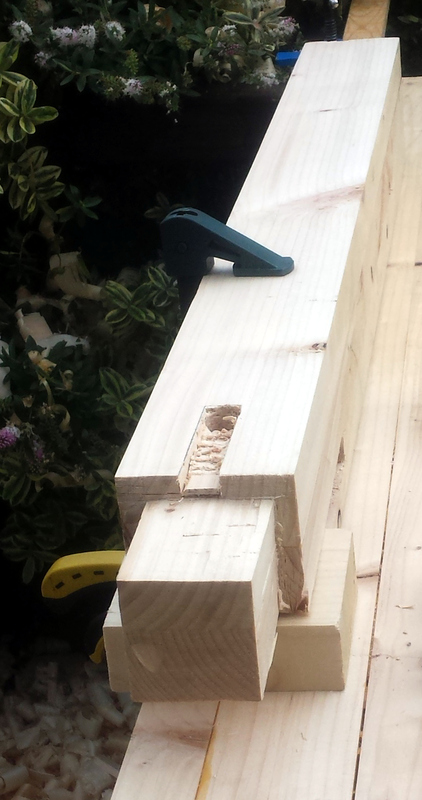 Speaking of cack-handed sins, I then tried to cut out the top mortice on the vice leg using Peter Seller’s method of chopping a mortice. I might as well have tried using Bob Seller’s method for all the good it did me. 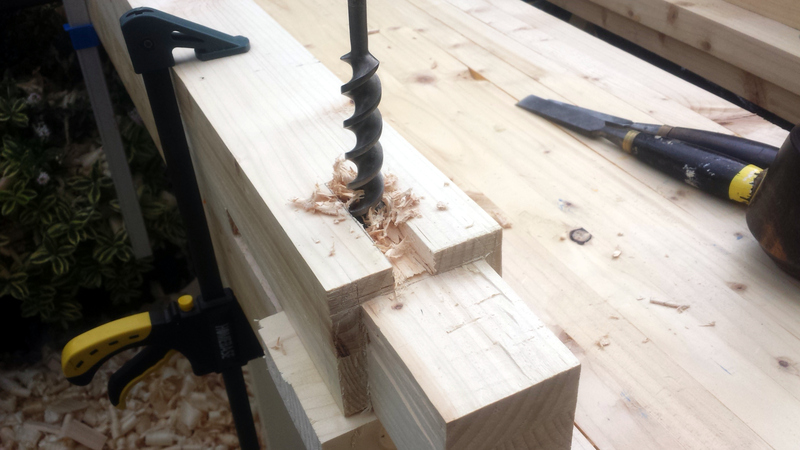 I damn near split the leg down the side with one tap on the chisel while taking out that haunched bit at the top, and I still wasn’t far into the leg. So I dropped that idea and cheated. I think it’s quite likely that they cheat better though. 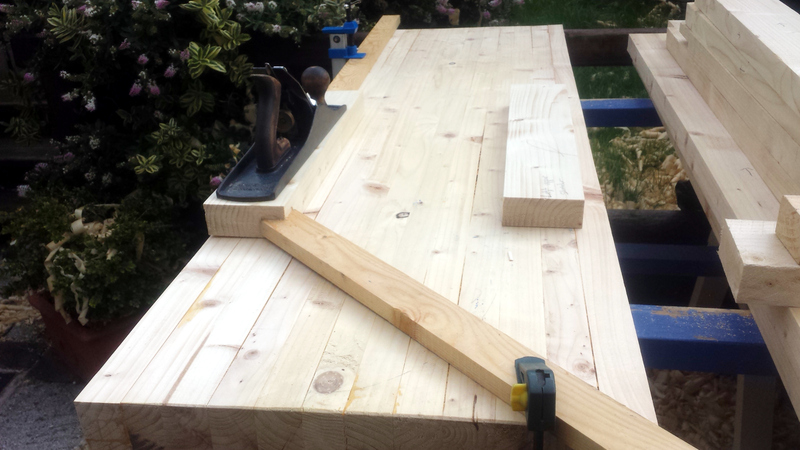 And then while sitting down and having a cup of tea, I realised that while I’d cut the first stretcher to the right length (with a few mm of excess to trim down), I had cut the second stretcher to match it in length. Only the second one was meant to be the bottom stretcher, and that one has to be two inches longer because the apron cuts into the front of the front leg but not the bottom part of it… Oh well. 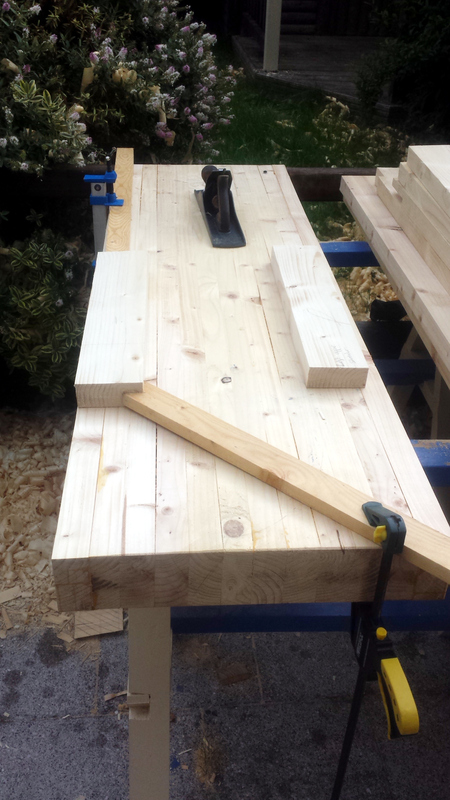 Made a start on that, cut one of the two remaining stretchers to the right length and started to plane it out of twist. The other remaining one will get the same treatment and the one I cut to the wrong length will do as the top stretcher for the other pair of legs, it’s the right size for those. Worked through till dark, still made not a whole lot of obvious progress. I’m starting to gain an appreciation for people who can do this stuff fast. I’m kindof hoping that by the time I get to the last mortice on the legs I’ll have gotten the hang of it and then I can fit the legs to the top and mark out and cut the tenons for the back part of the stretchers, trim everything to fit, glue up and drawbore. And then I’ll probably find the drawbore will drag the legs that half-millimeter closer together, ruining my alignment.